Empower your NaturallySpeaking software with a full-feature command set that enables true hands-free use of your PC. Consider a Dragon Installation and Training Flash Drive - 16 GB USB 3 Flash Drive containing any Dragon product full installation, Installation / Training Manuals, KnowBrainer Command Software, KnowBrainer Knowledge Base. We also recommend keeping a backup of your user profile and include instructions to do so. 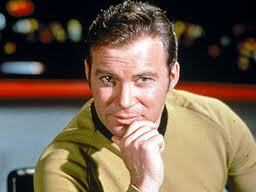 Click KnowBrainer videos if you would like to see KnowBrainer in action. 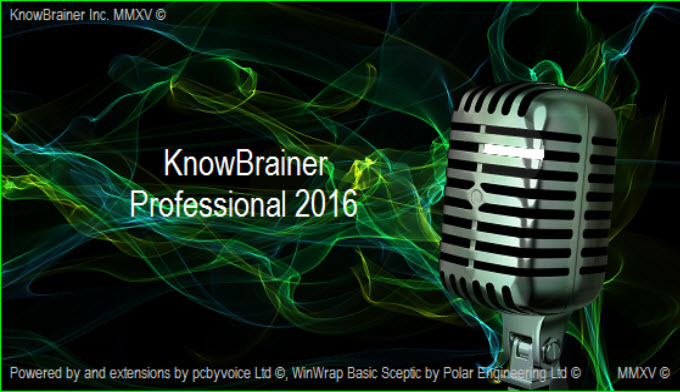 Click Top KnowBrainer Professional Commands to see a sampling of popular KnowBrainer 2017 commands. KnowBrainer 2017 is a third-party command utility that adds thousands of commands and numerous capabilities to Dragon, simplifies the learning curve and substantially increases your efficiency. KnowBrainer can even utilize built-in Windows speech recognition commands like DISPLAY Numbers which numbers every possible mouse click position so that you can left click, right click or double click any position with a single command. By comparison, the Dragon's MouseGrid command only works on 1 computer screen and can require up to 5 additional commands. From a command point of view, KnowBrainer is vastly superior to professional versions of Dragon which utilizes an older, limited and much slower command technology. 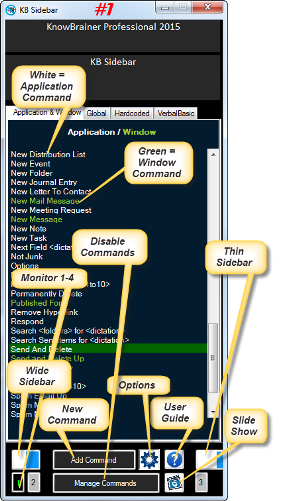 KnowBrainer also includes an interactive ultra-dynamic sidebar that displays all available commands and doubles as a Command Browser. You can find or open any KnowBrainer command by saying FIND COMMAND or EDIT COMMAND . 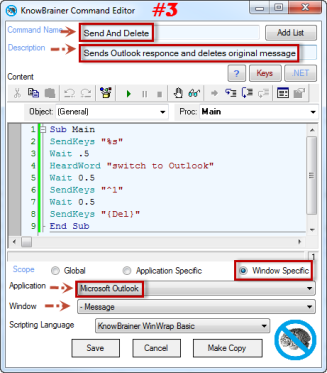 Example: Say Edit Command to open the KnowBrainer Paragraph command for editing. By comparison, the sluggish Dragon Learning Center (sidebar) is static and only displays a partial list of commands. KnowBrainer includes 65 open ended vocabulary commands (utilizing any vocabulary word/s), for Dragon 13 and higher, such as Google For , Search Contacts for , Spanish Translation for and Search Computer for . Dragon can only be used to directly dictate in less than 1% of applications. Non-Dragon friendly applications require opening the Dictation Box, dictating and then transferring your dictation to the target application. 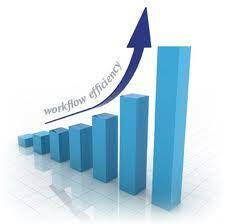 The KnowBrainer Insert command enables direct dictation in any field or application that accepts typing. Example: Say Insert to type "my dog has fleas" ANYWHERE! Click KnowBrainer 2017 PowerPoint Presentation for additional details. Note that the current PowerPoint presentation is limited to KnowBrainer 2015 but will be updated soon. Other new features include extensive help files, the ability to create Advanced Scripting commands in VB or .Net and much faster command deployment (twice as fast as Dragon commands and previous versions of KnowBrainer). KnowBrainer 2017 is only available in ENGLISH and only includes limited functionality for non-English versions of Dragon. KnowBrainer 2016 is compatible with Dragon 11 - 15 and DMPE 1 - 3 Windows 7 32-bit & 64-bit, Windows 8 and Widows 10 operating systems. Works with all versions of NaturallySpeaking from Preferred on up. Customers typically report the elimination of 25% or more of their labor costs when adding KnowBrainer to NaturallySpeaking. If you make a major part of your living from your computer, we still recommend purchasing NaturallySpeaking Pro or DPI (with KnowBrainer 2017) over Standard/Home and Preferred/Premium because Pro/DPI has numerous advantages over Premium. One of the main reasons why customers pay up to 6 times the price of the Home Edition for NaturallySpeaking Professional/Medical/Legal is for it's command capability. For those who cannot afford the professional versions of NaturallySpeaking there is finally an affordable solution; NaturallySpeaking Premium with KnowBrainer. If you want the world's best speech recognition engine but cannot afford or justify the price of Pro 13 and up, there is FINALLY an affordable second, more affordable option. "An essential tool to make the most of Dragon"
Review Description: The combination of KB-2014 and DNS 13 that I purchased last week is fantastic. They are everything that I thought a speech recognition software could be.